It all started with pumps. 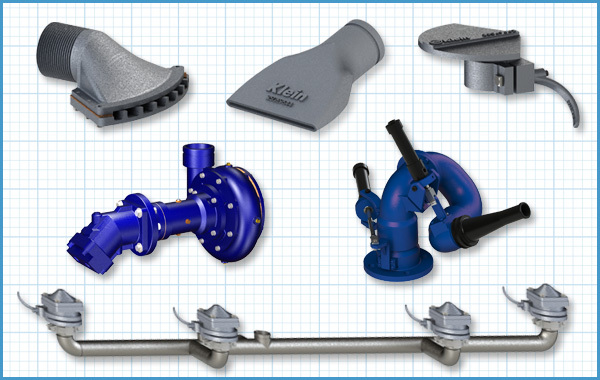 Until the early 1960s, Klein Products, like all our competitors, integrated commercially produced water pumps made by other manufacturers into our tank designs. However, these products weren’t designed for the harsh environments our customers operate in, and significant modifications were needed. As complaints about reliability, maintenance and durability rolled in, we urged our supply chain to develop pumps that their addressed these issues — but none were willing. So we began innovating, manufacturing and designing our own pump equipment, developed especially for the severe conditions of mobile-tank, off-road, heavy construction. From there, we expanded beyond pumps to other parts — such as our side-jet spray heads and diaphragm-actuated globe valves — all built with durability, simplicity, reliability and functionality in mind. As with many Klein Products innovations, our parts have been imitated time and again. But there is simply no substitute for genuine Klein Products parts — we build quality into every component to consistently deliver the proven value you deserve. Looking for a replacement part? Want to stock up on spare parts to be prepared for future maintenance? Simply fill out this form, and we’ll get back to you right away.